Caledonian Sky began life as one of the Renaissance octuplets, a family of eight virtually identical small, luxury expedition ships laid down in the late '80s. When Renaissance Cruises went bankrupt, the ships were dispersed to various operators and have been in continuous service ever since. This 91-metre-long ship joined Noble Caledonia in 2012 after an extensive refurbishment to bring it into line with Island Sky. This was at the time of Noble Caledonia's merger with Australian travel company APT, which still charters the ship several times a year. 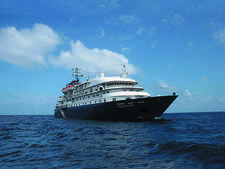 It had previously operated under the name of Hebridean Spirit with other companies. Of the original eight Renaissance small ships, Caledonian Sky is widely considered to be one of the best maintained vessels, offering a level of appointment and comfort in line with much newer ships in this niche and highly competitive market segment. A maximum of 114 passengers are accommodated on five passenger decks, with cabins arranged in various configurations on four of those decks. Cabins are divided into seven categories, ranging from Standards (with portholes) on the lowest deck to Deluxe Balcony Suites on Bridge deck. The aft sections are devoted to public areas and dining, with the main restaurant on the lower (Castle) deck, the lounge and presentation space on Caledonian Deck and the alfresco dining (buffet) on the Bridge Deck.